The present volume is the outcome of the workshop Copula constructions, focus and related topics in the Highland East Cushitic/Gurage convergence area organized by the editors. This workshop, held on December 10-11, 2004 at Mainz University, was supported by the German Research Foundation within the Collaborative Research Centre 295 Cultural and linguistic contacts – Processes of change in North Eastern Africa and West Asia (1997–2008). [...] it is a true mine of data and a bonanza of scientific hypotheses. There is much to learn and ponder on in this small, precious volume. 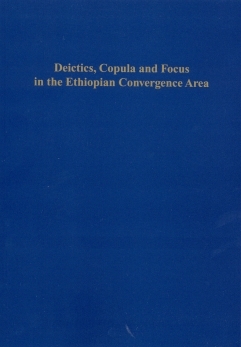 It is also the first book trying to establish “from below” (from the data and from smaller subsets of languages) the long-debated issue of Ethiopia (or a part thereof) as a linguistic area. It is only to be hoped that it sets a model for further work. In short, I recommend this book warmly, as it is of importance not only for those interested in Ethiopic linguistics, but also offers genuine insights to those interested in focus systems, the typology of non-verbal predication, contact linguistics and grammaticalization processes.